Oklahoma Knights of Columbus members had a dream – a warm loving environment where intellectually disabled adults could thrive. In the 1970s, most people with developmental disabilities were living in nursing homes or state-operated facilities. They knew firsthand there wasn’t a place specifically suited to meet the needs of the intellectually disabled community, and that weighed heavily on their hearts. In 1975, they set a plan in motion and took the first step toward the establishment of Center of Family Love. Over the next five years, the Oklahoma Knights of Columbus launched a statewide grassroots effort to raised 1.5 million dollars. The financial blessings came in all amounts; and every single donation received was a blessing. 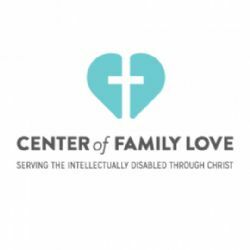 Center of Family Love was named and created as a non-profit organization. In 1981 the facility was ready for the first 48 residents. The new 20 acre campus consisted of an administration building and two residential halls. Through a grant from the Mabee Foundation a gymnasium and classrooms were added. Eventually, more foundation grants were received to expand capacity with two new group homes at the Center, a 6-bed facility in Yukon and two group homes in El Reno along with vocational centers offing job opportunities for residents.